You are here: Home / Store Deals / Albertsons / Albertsons Sneak Peek – FREE Ken’s Dressing! Albertsons Sneak Peek – FREE Ken’s Dressing! Woo hoo! It’s looking like a fun upcoming week to do some coupon shopping at Albertsons (starting tomorrow 8/22). 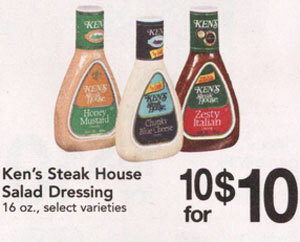 Right now I see Ken’s dressing will be free with a recent newspaper insert coupon. Also – Chex Mix (aka Crack Mix) will be on sale for $1.00 each bag. I will have the rest of the deals posted soon, so stay tuned. Oh and don’t forget that today is the last day to shop the Albertsons Round Up! See all the deals here.